As a parent, your exercise routine is likely fulfilled by chasing down your child on a daily basis. However, fatherhood comes with the additional concern of making sure your young one is staying fit as well. An active child is usually running, jumping or climbing. Though these can be worrisome activities for parents, it's important to remember that your kid is naturally curious and will explore his or her surroundings. Therefore, be sure to keep an eye on your child to ensure safety. 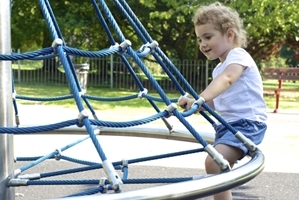 Take your young one to a playground or park to give him or her the proper environment to run and climb. Additionally, encourage your kid to join you on bike rides or short jogs. This way, he or she will get some exercise in and be able to spend quality time with dad. It also instills a healthy routine that your young one may keep in the future. If you make staying fit fun, your child will view it as a desirable activity. Today's modern world can make it difficult for parents to get their kids away from the television of mobile devices. However, inviting your child to join you will make the regimen more fun and engaging.